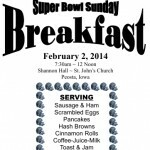 Come support the local fire department by joining us for the 10th annual Super Bowl Sunday breakfast! It will be Feb 2nd, from 7:30 AM to Noon at Shannon Hall, St. John’s Church in Peosta. You can click the thumbnail below for the full flyer.